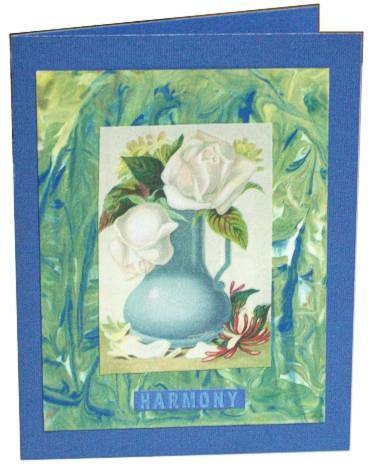 The sticky-backed rick-rack trim used on the tree and the border are the title element for this card. 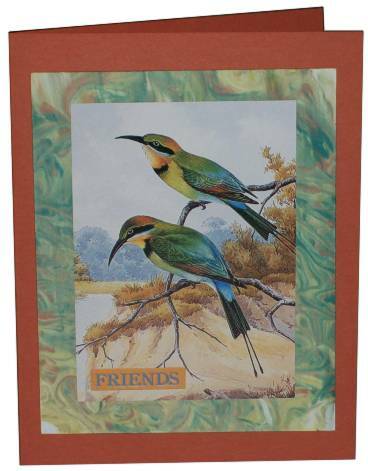 The tree was salvaged from an old card as well as the greeting. 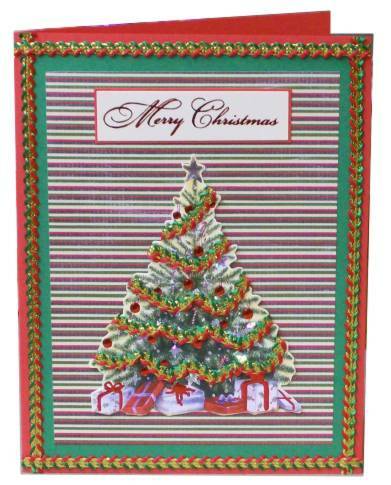 The striped background is scrapbook paper. This little sweater is made from sticky-back yarn that I got at Big Lots some time back. I placed braids of it side by side and then cut around the sweater shape (separate cutting for the sleeves.) I used some button brads down the front and then the parts were then pieced together. The text is rub-on letters that look like stitching. I applied them to green and cut out, then matted with yellow. 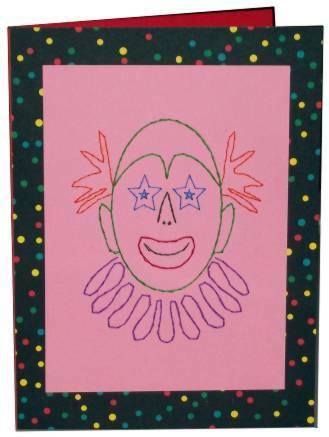 The yellow cardstock was trimmed out with 'doodle' lines in green. Photocopies of architectural elements were tinted with distressing inks and a bruch. I used a square punch to make all the squares the same size and mounted on black. 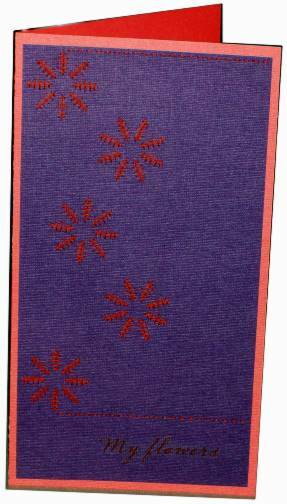 This is double-matted on lavender and buff. The lavendar text is a clear sticker. 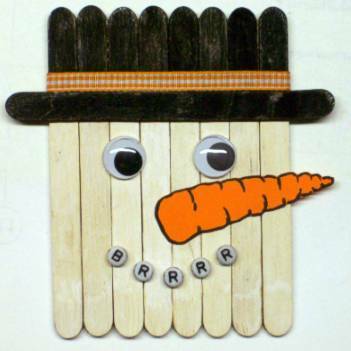 I've had the instructions for this little snowman in my idea file for ages. He is made from craft sticks, painted and trimmed up with elements using silicon glue. The carrot is drawn on cardstock and cut out. The hat trim is ribbon and the very cold mouth is letter beads. 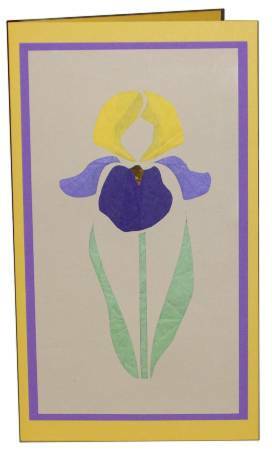 The rose printed vellum is mounted over a purple mat and a second larger mat is placed on top. 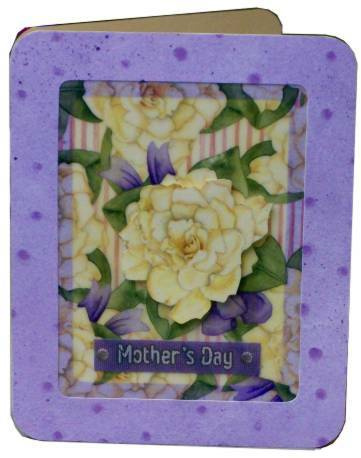 Rounded corners and a second rose mounted above the central image on foam tape give this an elegant finish. The text is a fabric sticker. 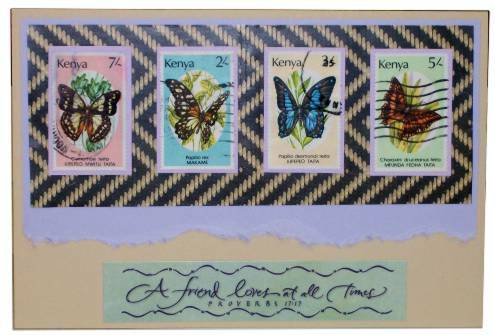 I sorted through a large collection of used postage stamps and found these 4 with the same theme and coordinating colors. 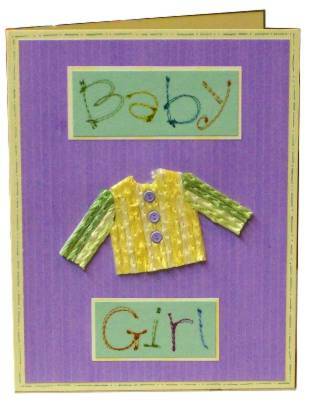 I used a basket-weave wrapping paper for background and layered it over another pastel not in the stamp colors. The text block is a sticker. When I think of the words "tea" and "crafts" together I get either 'tea-staining' or 'teabag folding'. You can bet that teabag folding is more up my alley so this is where I let it take me. 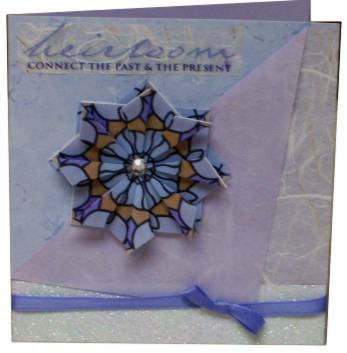 This cards layers include: blue print scrapbook paper, white mulberry paper with gold threads, violet mulberry paper, glittered paper, and ribbon - all selected to reflect the colors of the medallion. A clear text sticker was layered onto more of the white mulberry and mounted at the top for balance. A simple way to make marbelized backgrounds is to use a tray of shaving cream and drop ink from reinkers onto it. 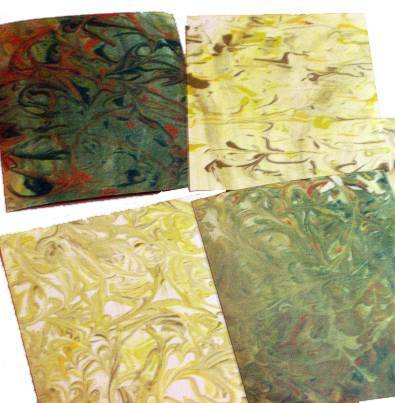 A skewer is used to stir around the inks into swirls and then a piece of glossy cardstock is gently pressed onto the surface, pulled away and wiped clean with paper towels. Well...not an actual rainbow - but a rainbow of colors! I designed this stitching pattern for a card embroidery challenge. This is a little off-beat! 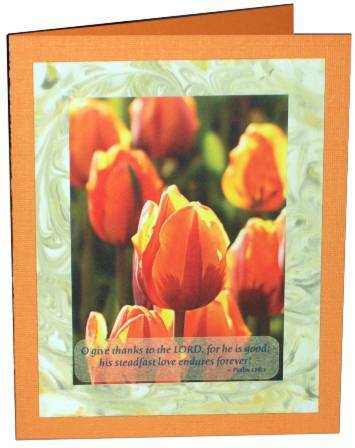 The first decision that sent the card in this direction was to stitch with orange thread on the purple cardstock. Then I decided to try a new stitch on the petals and the card started to look like art I had done in the 70s! I added some bands of sinple stitching and then mounted on orange cardstock to match the stitching. The text is a sticker. 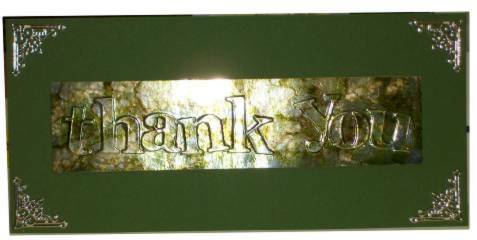 I made this paste paper background with purple tinted paste over green cardstock. I stamped with a handcarved dragonfly while the paste was still wet. 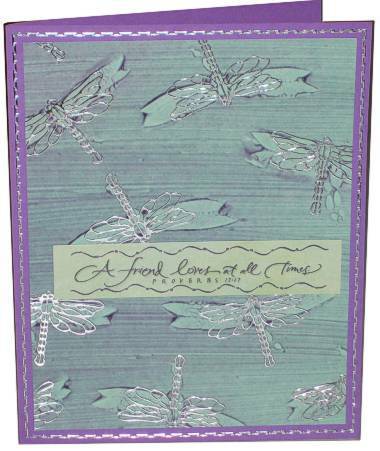 For the card, I placed a silver peel-off dragonfly over each impression, mounted on purple card and trimmed the borders with more peel-off. The text is also a sticker. 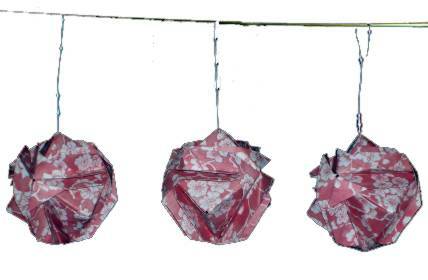 These modular origami balls use 6 units made from 3 1/2 inch squares. I made mine of floral scrapbook paper to give them a vintage look. Here you see all three of them on their hangers made of wire. Here is a close-up of one ornament. These are sturdy enough that they could have some potpouri placed inside and they could be tucked in a drawer with delicate garments. 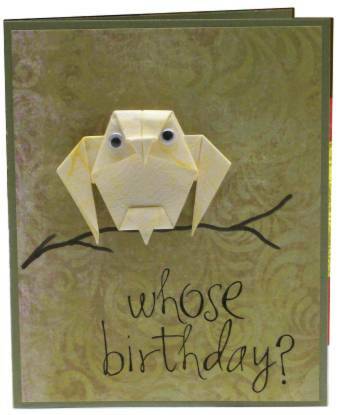 Here's a little night owl done up in origami. I used scrapbook paper for the background and rub-on letters for the text. punchout or sticker letters are arranged to a base card. Metal automotive tape is laid over the text and is burnished to get it into all the creases and crevices. Alcohol ink is used to colorize it. 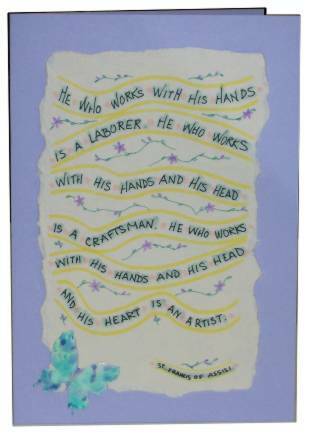 The finished text was trimmed and mounted to cardstock. Corner enhancements are gold peel-offs. I've found the way to make lettering look better, if you don't like your own handwriting, is to use caps, intentionally make uneven lines, try to make it look casual. 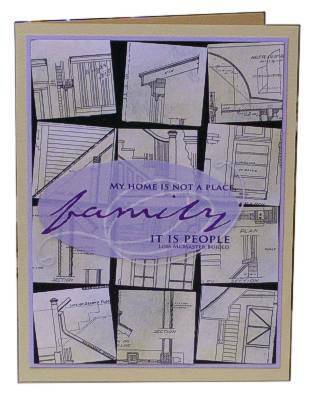 I wrote this out with a waterproof marker and made colored enhancements with watercolor markers and tore it out for mounting. Who's your white knight? This is the card to send him! The illustration is a digital print. All enhancements are gold peel-offs. This photo of strawberries has been calling out to me ever since I wrote down this theme. 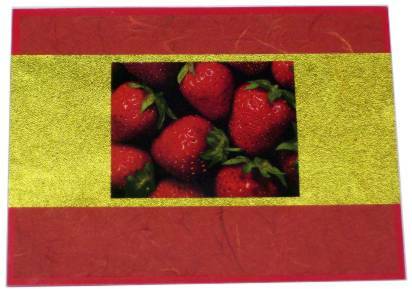 I used gold textured foil paper as a background and layered over red mulberry paper and red glossy cardstock. Everything about this card says 'richness'. 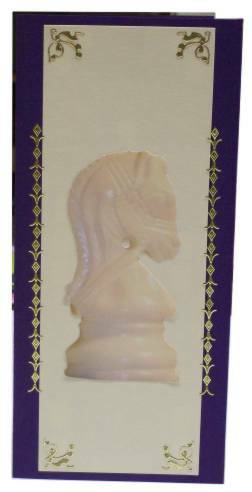 I will add a gold peel-off greeting when I decide on the occasion to send it. 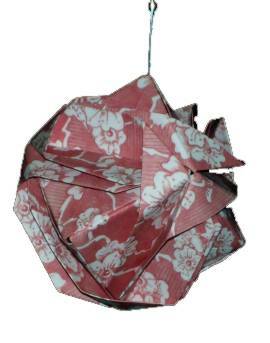 Yep, its Iris Iris Folding! LOL! 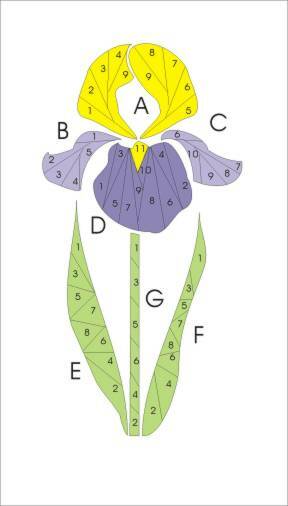 I designed this bearded iris in iris folding just for today's theme. I've worked it up in folded strips of tissue paper. 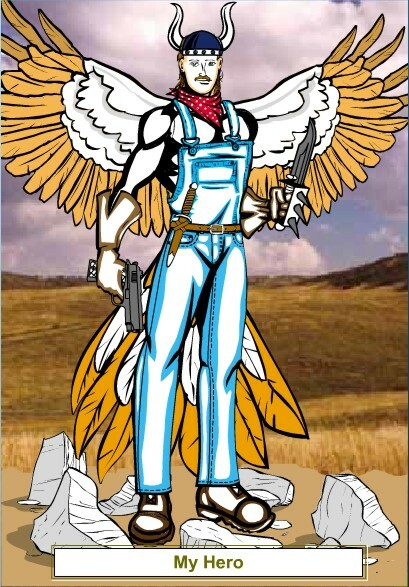 I went through all the steps and put together this digital image which MAY go on a card for a hero of mine! I thought it would be a good lesson to show that you don't have to be able to draw to create great (?) art! 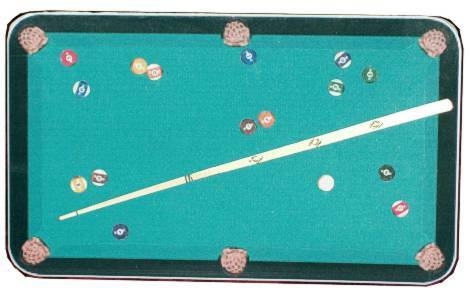 This table is a digital image printed on cardstock, folded and trimmed to round the corners. The balls were printed and punched out using a 1/4" punch. I built the cue from farious papers and embellished with markers and gold peel-offs.